Why should our solar system’s planets get all the attention? There are things about our own Moon that we either still don’t know or have just learned about, half a century after 12 human beings walked on it. Other moons may harbor life or contain evidence about incredibly violent events that have changed the very nature of the solar system. A few moons are just plain spectacular, like Charon. What’s Charon, you ask? 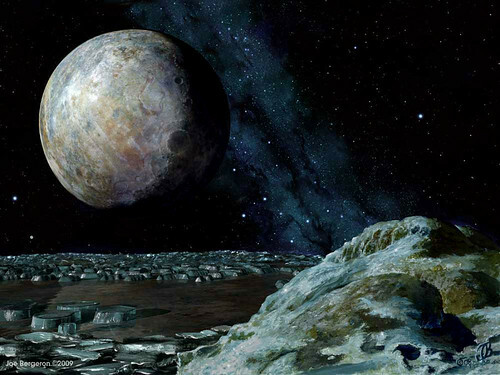 Pluto and its biggest moon, Charon, are locked together in a gravity dance where they always face each other. So what? Well, it means that an astronaut on Pluto is either not going to see Charon at all or will see it overhead constantly. Our Moon is locked to Earth by gravity, too, and that’s why we never see its far side. The difference is that Earth is much bigger than the Moon, so only the Moon is locked. Pluto and Charon are almost the same size, so each is locked to the other. One weird effect of this is that if you’re on the far side of Pluto, you never see Charon. On the near side, it looks about seven times as big as our Moon does and just hangs there in the sky, cycling through its phases in a little over six days.